And they happen to match! How cute! Speaking of cute, I noticed that Superbuzzy is having a sale on some of their items. 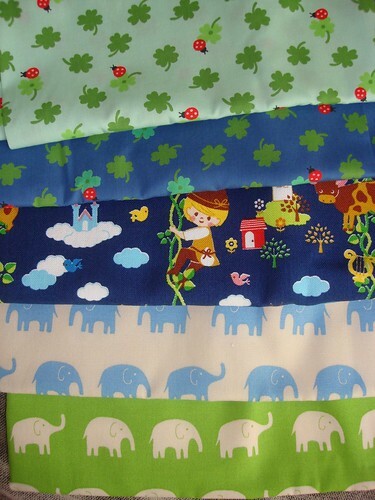 If you haven’t shopped there before, Superbuzzy carries a TON of cute Japanese import fabric. Be warned – it is too adorable to resist. Here is a selection from one of my previous purchases. I noticed that there are some cute cross-stitch tape kits on sale too. Tempting…..
Hopefully next time I post I will have finished a pair of handknit socks for myself. 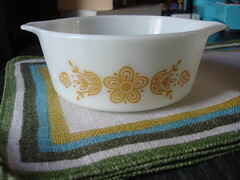 8 Responses to "Saturday Shopping"
What great finds – love the pattern on the old pyrex!! Loving the elephant fabric. Love Pyrex too – it has such a great texture. Hey there, why oh why did you mention superbuzzy and sale in the same breath?!? LOL I’ve been trying to keep from breaking the bank there and going well, I want that Elephant fabric so bad. LOL Oh and the hedge hog trim…toooooooo cute! I have a similar Pyrex bowl that was passed down to me. It used to be a set of 3, but, um… Well, you know how that goes. I love that fabic, but I cannot.start.another.hobby. At least not until I get my sewing machine serviced.